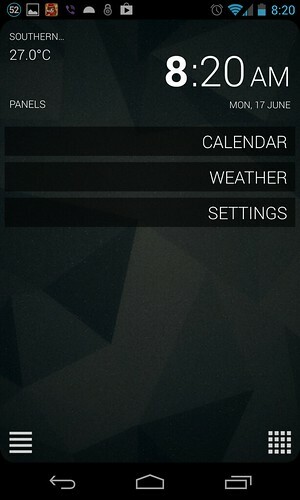 SickSky Launcher (Google Play Store link) is a very simple Android launcher/home screen, with no widget support. If you love your widgets, this launcher is not for you. But if you just want access to your apps, calendar, and weather, you might want to check this out. When launched, the homescreen is divided into three panels. 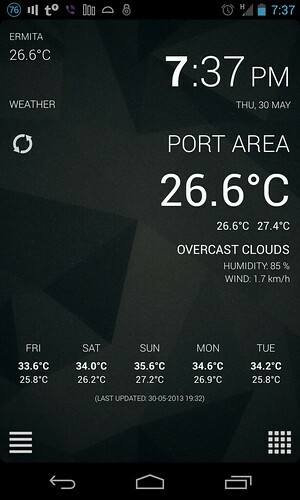 The top panel shows the current temperature for your location, and the date and time. The middle panel is mostly empty unless you do some actions. The bottom panel has two buttons. But where are your apps? Click on the button on the right of the bottom panel, and you get to see all your apps at the middle panel. You swipe to the left or right to access apps in another page (16 icons are shown per page). To show more information about the weather, just click on the temperature at the top panel, and more information is shown in the middle panel. But I have found one quirk with this panel. See screenshot below. As you can see, the locations shown in the top panel and middle panel are different. Anyway, you are shown temperatures, 5-day forecast, and current condition. To access your calendar entries, you need to access the settings by clicking the button at the left of the bottom panel (see topmost screenshot). There isn’t much customization options. 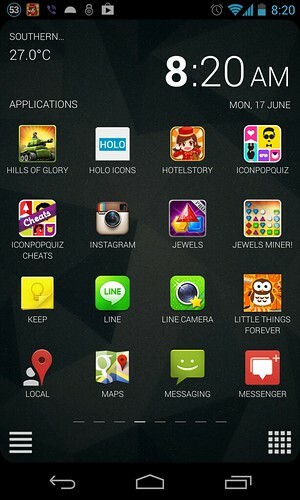 This is a simple, minimalistic, no-frills launcher that works fine if you are not fond of customizing your home screen. I like this launcher, but I do like having a panel showing my frequently used apps – it can be tedious swiping around if you have tons of apps installed. Power users will not be fond of this launcher, but for those who like their home screens simple, this app is worth their time. This entry was posted in Byte and tagged android, app, launcher. Bookmark the permalink. ← Sungha Jung in Manila!